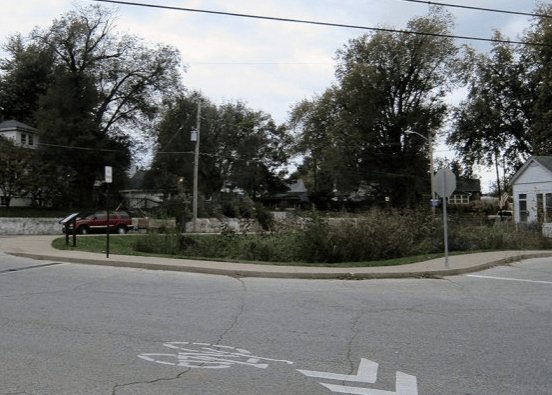 One of the top many-problem-one-solution projects we’ve seen is also among Louisville’s smallest interventions, and it’s tucked away on one of the German-Paristown neighborhood‘s most unusual intersections. “If you look at this intersection, there are five streets that come together including an alley,” Wes Sydnor, program manager at Louisville’s Metropolitan Sewer District (MSD), told Broken Sidewalk. He was describing the intersection of Ellison Avenue, Swan Street, Dandridge Street, and an alley that was once an enormous swath of asphalt with traffic coming from all directions and no signage or markings to help pedestrians, cyclists, and motorists navigate the expanse. “So you have an intersection where the signage wasn’t as clear as it should have been and as a pedestrian it was a risky endeavor to cross there,” he added. Why was Sydnor, who oversees green infrastructure programs at MSD, so interested in traffic patterns on an obscure neighborhood street? Because the paving was sending rainwater into an already overburdened Combined Sewer System, and in turn contributing to sewer overflows that continue to pollute nearby Beargrass Creek. The strange triangular shape of the intersection dates back to Louisville’s trolley days, when the Oak Street line made a right onto Swan Street and turned around in the space. “To give it a sense of scale, it was large enough for a trolley coming from downtown to do a full loop on tracks and then head back north,” Sydnor said. Today, the intersection looks very different. A new garden filled with native Kentucky species now fills the center of the intersection, delineating clearer travel paths for all transportation modes and bringing in much-needed traffic-calming measures. Projects like this could be replicated around the city, according to sewer district officials. And because the city is under an EPA consent decree to reduce combined sewer overflows, there is money available to make it happen. Elsewhere on the Network today: At Transportation for America, former Amtrak Board Chair John Robert Smith discusses the implications of Tuesday’s deadly derailment. The Transportationist remarks on how policy makers often use language that signals transit riders are “the other.” And Bike Portland explains the Oregon Department of Transportation’s feeble response to a recent “die in” protest at its regional headquarters. We want to take a moment to honor the life of Branden Klayko, an architect and Louisville native who founded the local blog Broken Sidewalk, which was part of the Streetsblog Network for years.